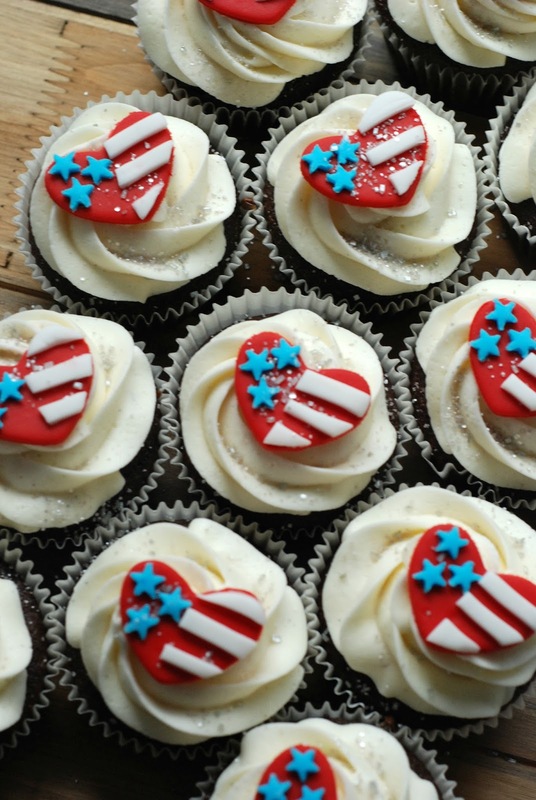 This week I made a batch of patriotic cupcakes for one of our most favorite neighbors. Ron and his wife live across the street from us and are just the most amazing friends. My son runs over there daily to see what Ron is up to and sit on the porch with him. They spoil my kids rotten and are always looking out for us. When I heard that he was turning 75. I wanted to make something special for him and to honor him as a Vietnam Veteran. I love making fondant cupcake toppers right now. It's such a low stress way to play with fondant and learn more about it. 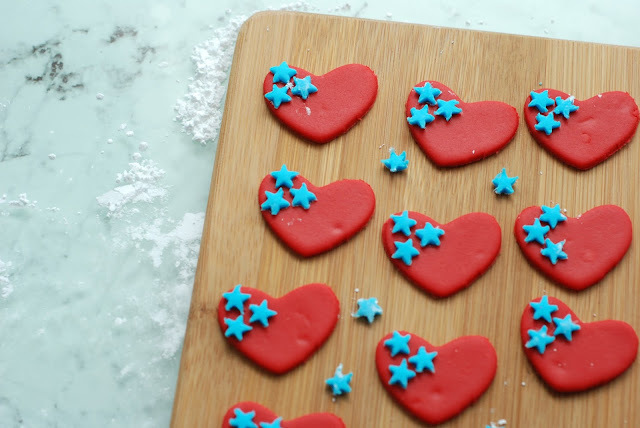 The toppers are easy to make and can be easily peeled off if it's not your favorite flavor; there is a generous mound of delicious buttercream underneath! Aren't they so sweet? They are also crazy perfect for the 4th of July! 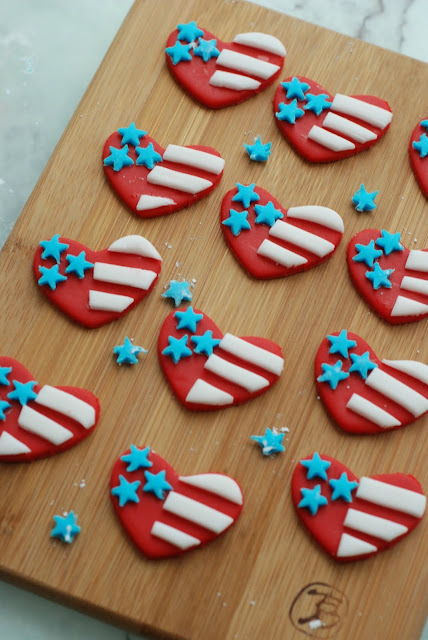 You still have time to whip these up and enjoy while you watch the fireworks. You will just need about a fist sized amount of fondant to create these American flag heart toppers. Split it up into 3 bowls and dye two of them blue and red. I always wear disposable gloves when I work with fondant, especially during the dye time. 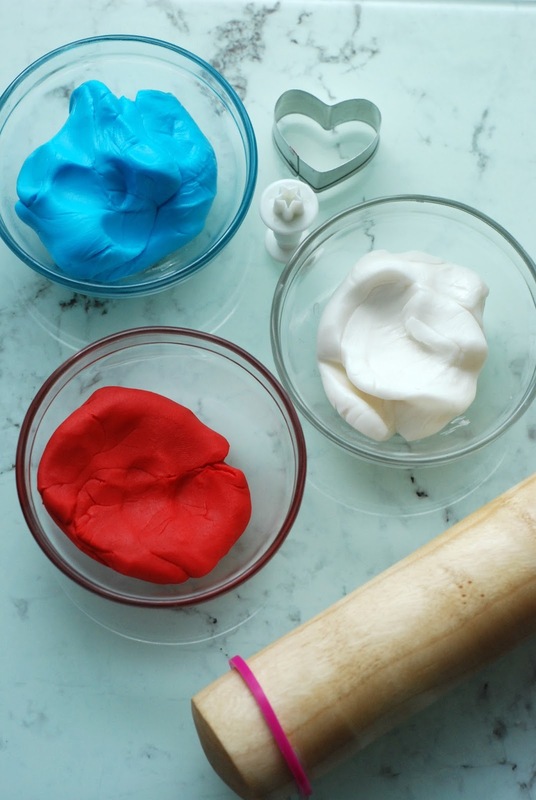 Fondant picks up any dust available to it and the dye will leave your hands colored for days! 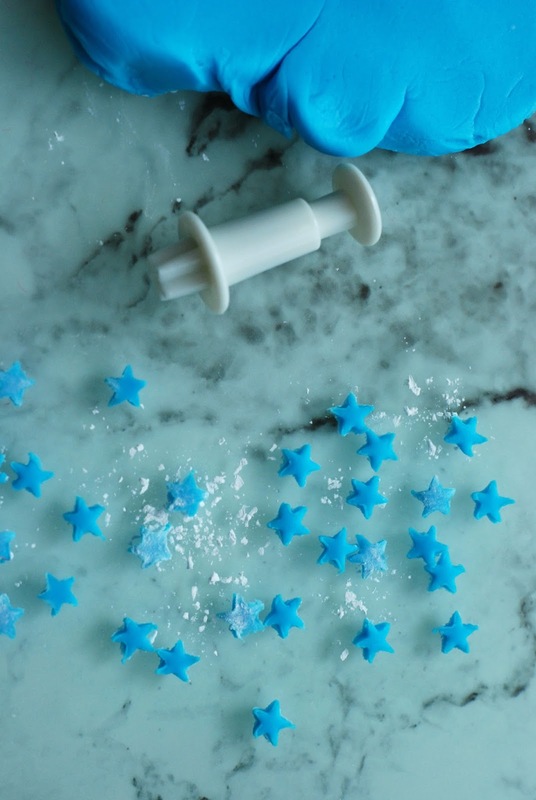 Roll out your blue fondant to about 1/8" thick and with the star extruder, punch a ton of stars out. I used 3 stars on every heart topper. You may want to punch extra out just in case. Set them aside in a dark, cool spot to dry and stiffen up. 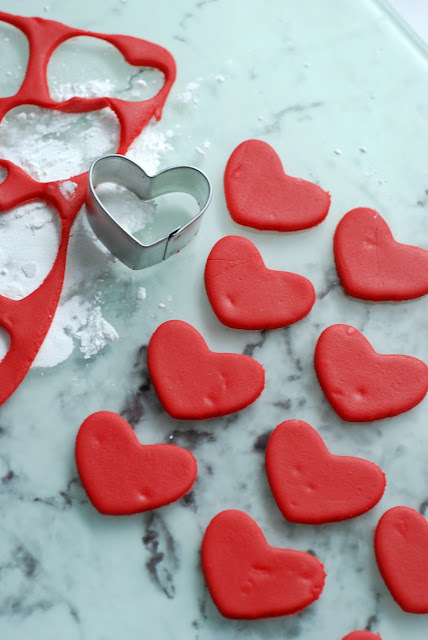 Roll out your red fondant to somewhere between 1/4-1/8" thick and create hearts with your cookie cutter. Just cut out as many as needed and you can soften the edges with your fingers tips if needed. If you have left over fondant, cover it with Crisco and keep in an airtight Ziploc for later use! Carefully paint a small dab of water on the left side of the red hearts and press the blue stars down. The water acts as glue for fondant, but you really only need the smallest amount or you will have a mess! Aren't they so fun already? Now it's time to add stripes to that ol' American flag! Roll out your white fondant to 1/8" thick and cut out hearts with the same cookie cutter. 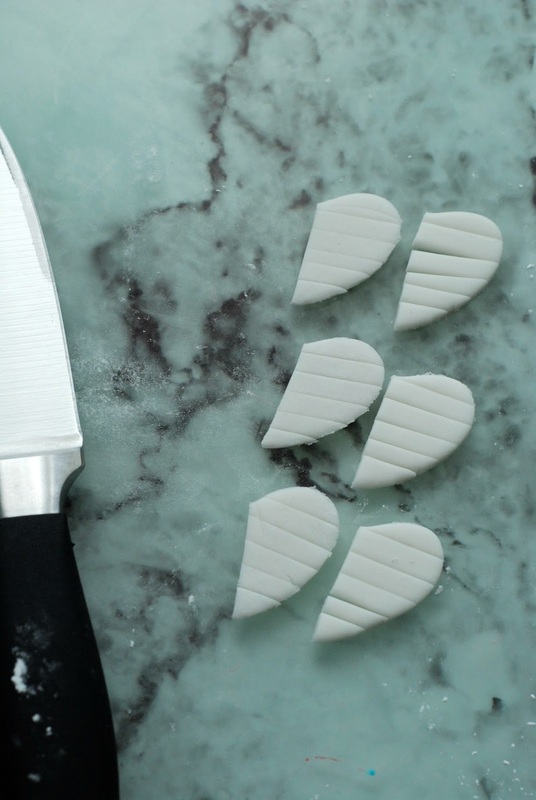 Using a very sharp knife, slice the hearts in half and then stripes. Each half heart will give you enough strips for 2 red hearts - you need to leave space for the "red stripes". Just like the blue stars, paint a small bit of water on the right side of the heart where you will be placing the white stripes. Gently add the stripes and press them down. Set these yummy cupcake toppers aside to stiffen up. You will want to place them on the cupcakes right before serving. The buttercream softens the fondant quite quick and you don't want a soggy topper! 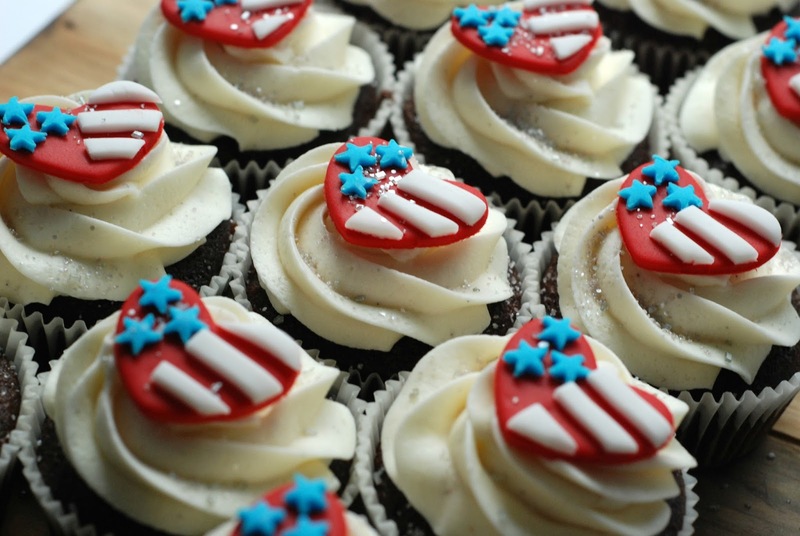 Ron just loved his patriotic birthday cupcakes and I know that your guests will love these as much on the 4th of July! They are sweet, easy and beaming with American pride. Your work is so amazing!! 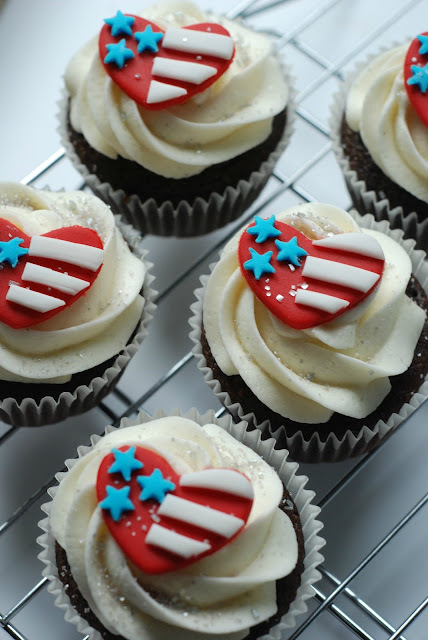 What a perfect cupcake for Fourth of July party.